The recipe for roschettes is a recipe that has been handed down to me by my grandmother. 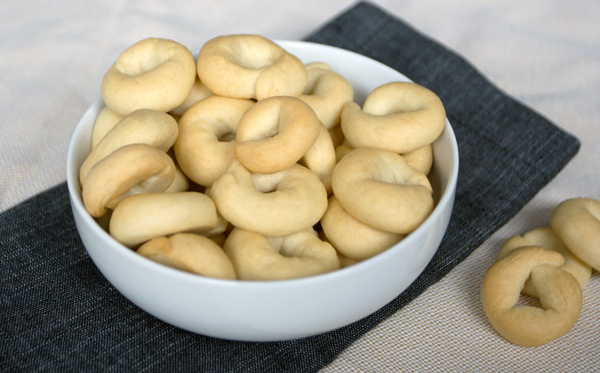 They resemble Italian tarallucci to some degree, at least aesthetically, but taste more like the breadsticks. Grandmother Emilia, the daughter of Italian immigrants, born and raised in Tripoli, a Jew in an Arab world, learned the art of taking the best from every culture. This is the recipe that proves it more than any other. My grandmother would always offer the roschettes to a guest or an acquaintance who came to visit. They were served at any time, simply turned upside down in a small bowl, together with a steaming cup of Arabic coffee and … needless to say, they were gobbled up immediately! In a large bowl, dissolve the yeast in the water and add the oil. Pour the flour, the semolina, salt, and some of the fennel seeds (if you like them) into the bowl, and knead vigorously until you get a non-sticky dough, a little softer and more elastic than bread dough, so to speak. The amount of flour is indicative; I would say that it is about 500 g, but as you knead the dough, you will know when it is enough. If you put the fennel inside the roschettes, do not put the sesame on top of them, because the two flavors do not go well together. Put the dough to rise in a warm place for an hour; in the meantime, preheat the oven to 180°C. When the dough is well leavened, it’s time for the difficult part of the recipe: take a little bit of dough with two fingers and make very thin rolls, then close them in a ring and place them on a sheet of parchment paper; the dough rings have to be really thin because the roschettes will continue growing in the oven, thus is they are not thin enough, you risk finding yourself with roschettes that are too puffy, and ugly to look at. If you like sesame seeds on the roschettes, brush them quickly with a little water, and put some sesame seeds on each ring. Bake the roschettes for about ten minutes: when they are still a bit pale, I would say almost white, but already baked and crunchy, you can take them out of the oven; a good way to know if the roschettes are ready is to check that they comes off easily from the parchment paper. Once you have taken the roschettes out of the oven, remove from the pan, and let them cool in the open air.